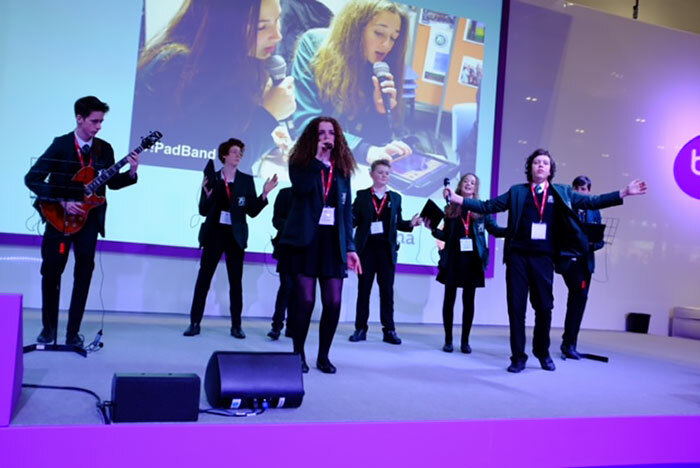 Last week, whilst students led workshops and tours for over 400 international visitors at Bohunt School, nine pupils performed in front of thousands as part of an iPad Band. The point of both the visits and the band was to highlight the power of technology to enhance learning when combined with certain teaching techniques, something that Bohunt, which was the TES ‘Overall School of the Year 2014’, does to excellent effect. The iPad Band was put together and rehearsed by staff from Bohunt School and David Kirtlan from Elsium. They were performing at the huge Bett Show (formerly known as the British Educational Technology and Training show) in London Excel. Using an app called Garageband the students started off in the audience playing their iPads wirelessly. In some cases it was only when the students started heading up on to stage that delegates realised that the child next to them was actually the voice or instrument coming out of the speakers! The band was meant to perform twice a day from Wednesday to Friday. However, such was the reaction to their performances, that they ended up performing five times a day and being asked to come back on the Saturday. The iPad Band grew out of Bohunt’s iPad Band Room, which allows students playing iPads to jam live and/or record in groups with students playing live instruments. It creates challenge and enables all students’ access to outstanding learning, regardless of their level of musical skill. It also builds students’ intrinsic motivation to learn an instrument and develop their musical ideas. In these ways the technology is allowing students to do something very different with their musical ideas to before. This is the same across the school; for example, innovative classroom environments focused on group work, with whiteboard walls and high powered computers allow for computing and programming to be taught in a challenge based way and iPads linked to sensors allow students to design their own science enquiries. It was these learning environments and methods of teaching that students spent the week showing visitors from across Europe, Africa and the Middle East. After a talk by senior leaders on Bohunt’s vision of education, exceptional results and technology project leadership, students took visitors on a tour of the school, including the new technology block and the new teaching block and sports hall that are currently under construction. After a quick refreshment break, the Headteachers, government officials and politicians then observed lessons or took part in workshops led by the students. “If you’re not at the BETT Arena, then get her quick for the performance of your lives! They’ve got soul!” Foreign & Commonwealth Office.